Acratech is extending their line with dedicated panorama (shown here) and macro heads. They also have a universal SLR L bracket which breaks with the tradition of dedicated custom-fit units. 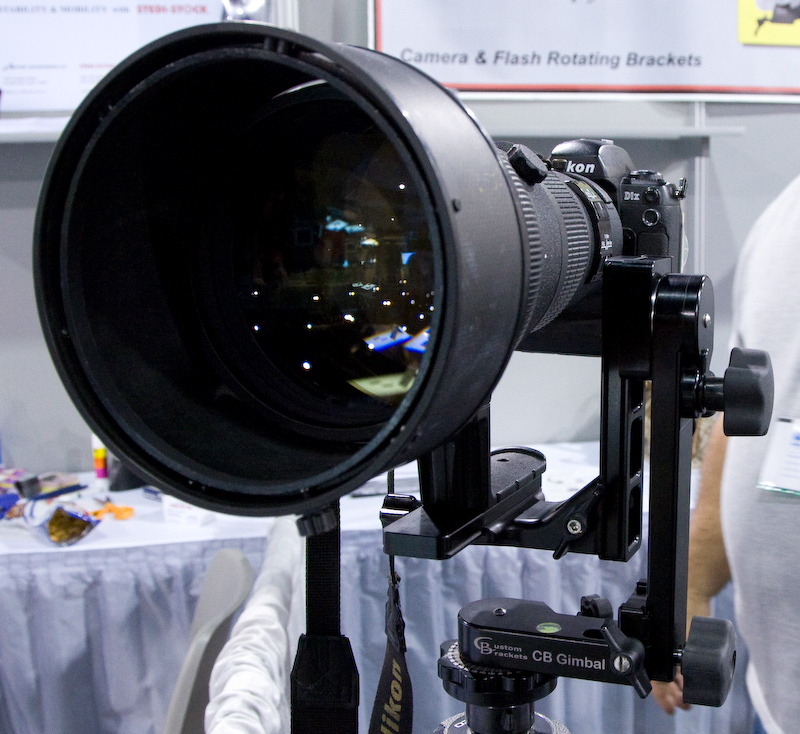 The panorama head should appeal to the increasing number of SLR shooters taking panos. Availability on the pano head is February. Delkin's 2-sided Universal charger can charge a camcorder battery and a digital camera battery at the same time, reducing the number of chargers you have to carry. It comes with a popular battery adapter and you purchase additional adapter plates . 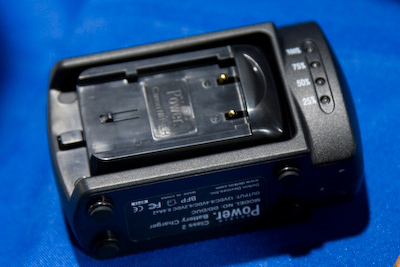 Unfortunately, it doesn't work with the really big batteries that many pro cameras use such as the Canon LP-E4. If you're the type that often wants to download three or 4 memory cards at once, the Delkin Devices Image Router is the solution for you. 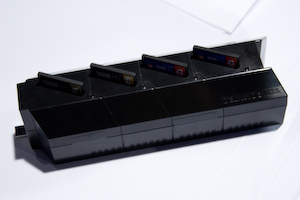 Not only will it take four CF cards at once, you can dock them end-to-end, and have an 8-port, 12-port etc. mega downloader. NRD was demonstrating their Firefly electronic air ionizing sensor cleaner. 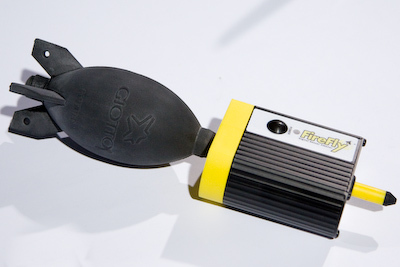 It looks like a turbo-charged Giotto Air blower, and it is. There's a 9V battery that powers an air ionizer so the air you force through it gets filtered and is ready to neutralize the charge on the camera's sensor. Turn your camera upside down, spritz it with the ionized air a few times, and the dust just falls out. I'm told that at least one tier one camera manufacturer has filed a patent for putting an ionized air generator into cameras. Last year NXP was pushing a software GPS solution for geotagging photographs, and Jobo was supposed to be introducing a product using their technology. Well, it's a year on, and Jobo has switched to different hardware. NXP is intent on spinning out their SW GPS group as a new company called Geotate. 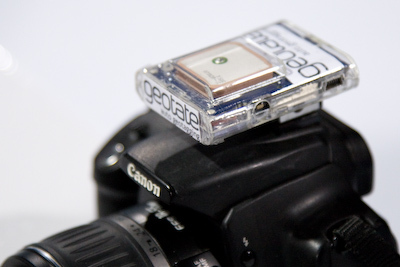 Their prototypes looked as small as ever, and the battery life is nearly infinite since it just powers up briefly when a photo is taken, but the tier one players are still waiting on the sidelines when it comes to putting GPS in cameras. Olympus showed their SP570UZ 10 mega pixel 20X optical zoom ZLR. It's really pokey with the lens extended, but just think -- in terms of 35mm lens equivalents, that's like having a 1000mm lens in a really compact package! 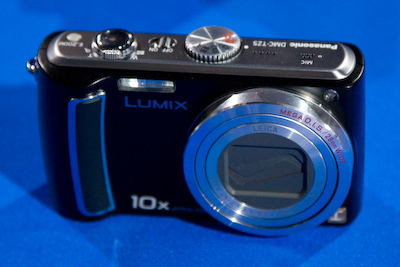 Panasonic's DPC-TZ5 sports what they call "Intelligent Autoexposure," which prompted me to quip "not like the competitor's unintelligent autoexposure." They claim that it dynamically adapts the ISO pixel by pixel for different regions of the image, making it similar to an automatic version of RAW shooting that pros use all the time. The demo photographs they showed with and without the feature turned on were compelling, but it will be interesting to see it shaken down objectively in a test. And now, for something really creepy. 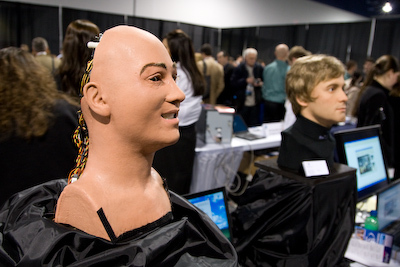 Photo Nation, the company that's providing face, smile and blink recognition software to much of the industry, was there with Rod Cone (left) and Frankie (right) -- their animatronic faces for testing their software. Rod has a business card, but apparently no e-mail address. He does have a phone number though if anyone's interested. 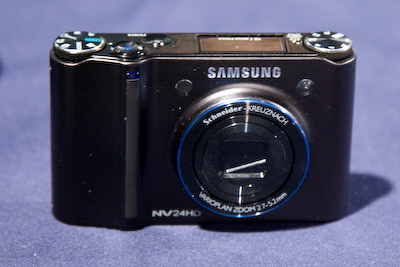 Samsung showed their new NV24HD which is capable of capturing 720P HDTV video in an incredibly compact digital still camera form factor. 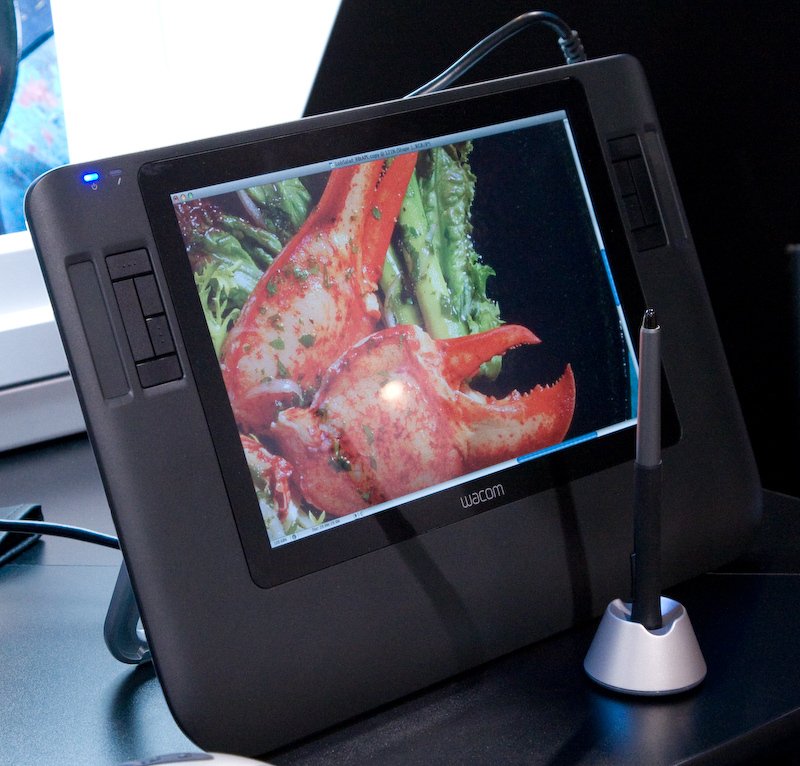 Wacom's new Cintiq 12wx $999 display-integrated pen-tablet input device for professional photographers. This is significantly cheaper than previous Cintiq tablets which started out at around $2,000, They were demonstrating in the booth that the tablet screen and computer screen can be calibrated to match prints and each other -- something critical for photographers. Marumi's cell phone wide angle and macro lens. Many vendors were showing cell phone camera accessories -- probably hoping to get one in ten thousand customer to buy them, which by photo-accessory standards could still be a large market. 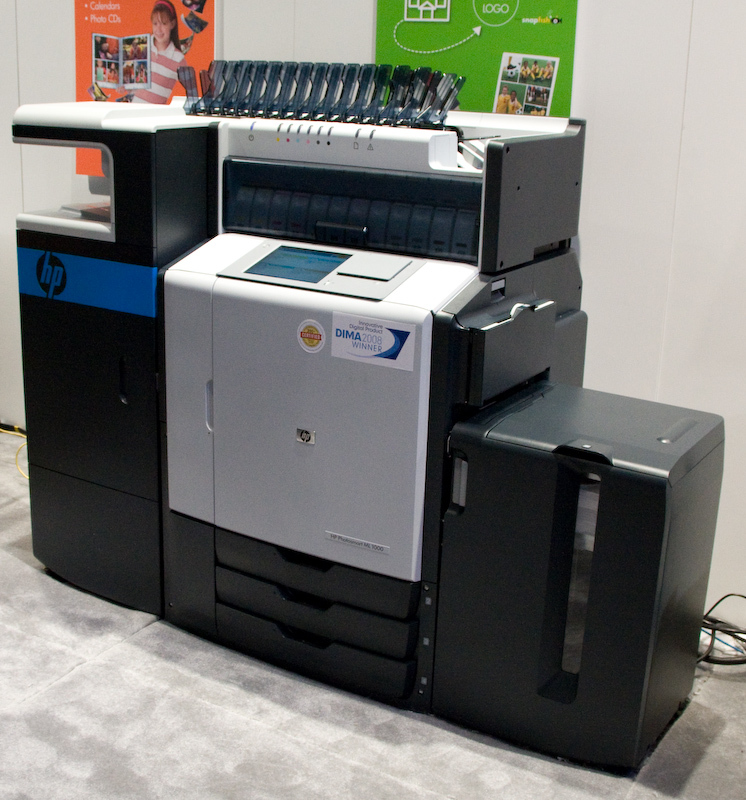 HP stepped it up a notch in their retail photo offerings by showing their HP PhotoSmart ML1000 minilab which is capable of producing 1500 4x6" prints per hour. Both retailers and competitors were milling near the product with keen interest. 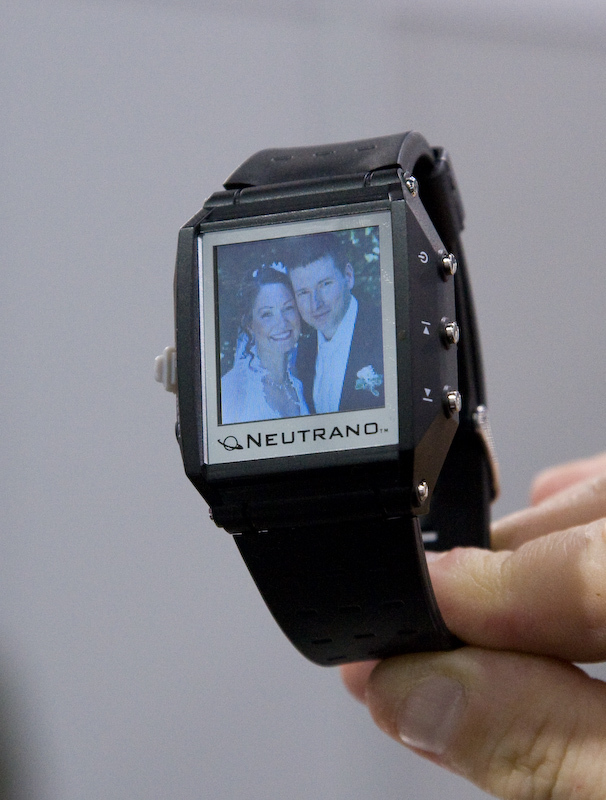 The Neutrano photo watch was also shown at CES, but seemed worth a picture, since it's one of the more convenient ways to carry a small portable photo viewer. Custom Brackets introduced a truly robust gimbal mount for really big lenses like the 400mm F2.8 and 600mm F4.0 monsters that sports and nature photographers use. Though Wimberley has traditionally dominated this space, the Custom Brackets CB Gimbal claims many innovations and advantages including roller bearings, separate tension and more compact disassembly for packing. 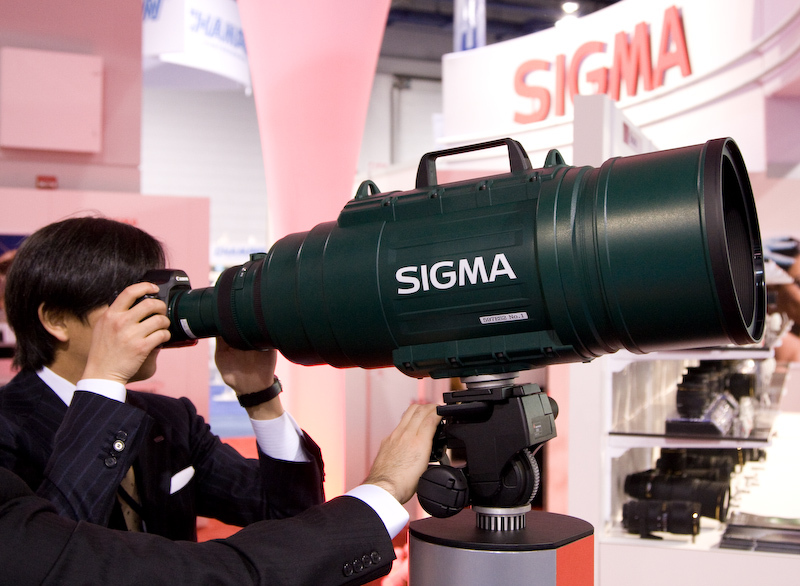 Sigma showed their 200mm-500mm F2.8, 35 pound beast again, but this year, it had a 2x "attachment" on it to take it to 400mm to 1000mm at F5.6. It has it's own LCD display to show focal length and focusing distance, and you can definitely hear it focusing (lots of glass to move I suppose). Of course, it has it's own battery -- something that became very clear when they let me mount my camera on the lens to take some pictures, and the focusing stopped working. After a minute or two of suspense (when I was glad no one was accusing me of breaking their only prototype), the Sigma guys opened a door and replace a battery, then all was well again. Price is about $25,000, and availability is Spring to early Summer. 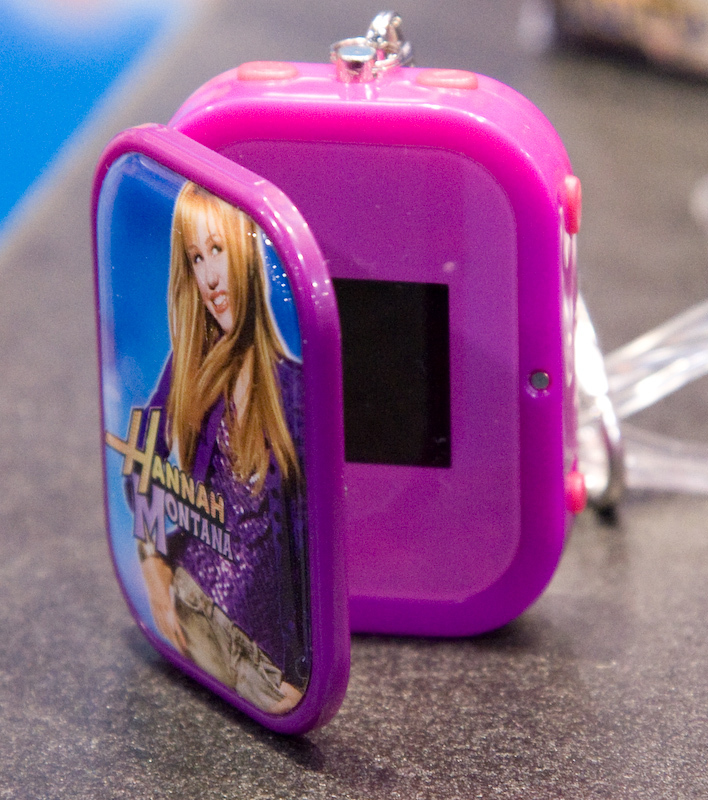 The Hanna Montana Photo locket is just one of many Disney-licensed photo-viewers from Vu-Me designed to appeal to teens and tweens. They were also showing High School Musical and Tinkerbell branded players. 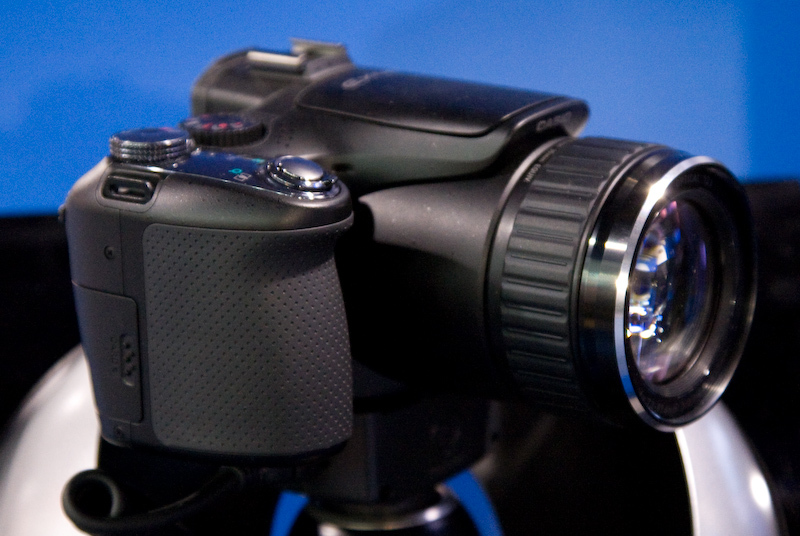 Casio's Exilim EX-F1 is the ideal camera for making your own Myth-Busters-like slow motion movies since it can take VGA resolution images at up to 600 frames per second. It's also potentially the world's best camera for getting that picture of little Bobby hitting the baseball right at the moment the ball hits the bat, because it can take 6 megapixel images at 60 frames per second. You better buy a big memory card though, because at those rates, you'll fill it up very quickly. 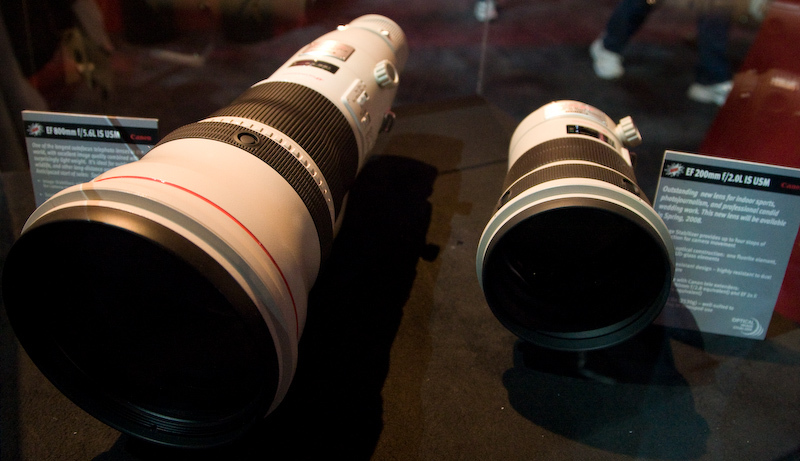 Canon is now shipping the 200mm F2.0 lens at a suggested street price of $6,000. The booth personnel claimed that the lens' light transmission is closer to the discontinued F1.8 lens than the numbers would suggest -- maybe the new glass is more transparent? The 800mm F5.6 still has no scheduled delivery. Canon's new Rebel Xsi features many new features, but the two that caught my eye were the auto-lighting optimization and live-view focusing. The auto-lighting optimization "analyzes the photographic scene and compensates automatically, brightening dark faces, boosting contrast, and brightening highlights in flat light." 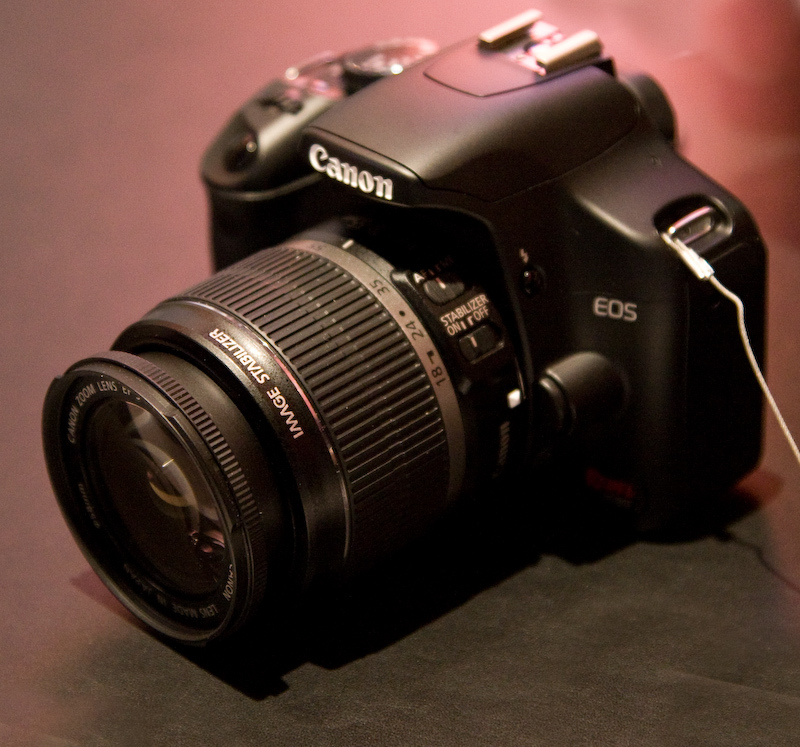 The live view is the first EOS camera to use the sensor to do the auto-focusing when displaying an image on the back of the camera. Other EOS cameras rely on manual focusing, or have to flip the viewfinder mirror down (stopping the live view) to enable auto-focus. 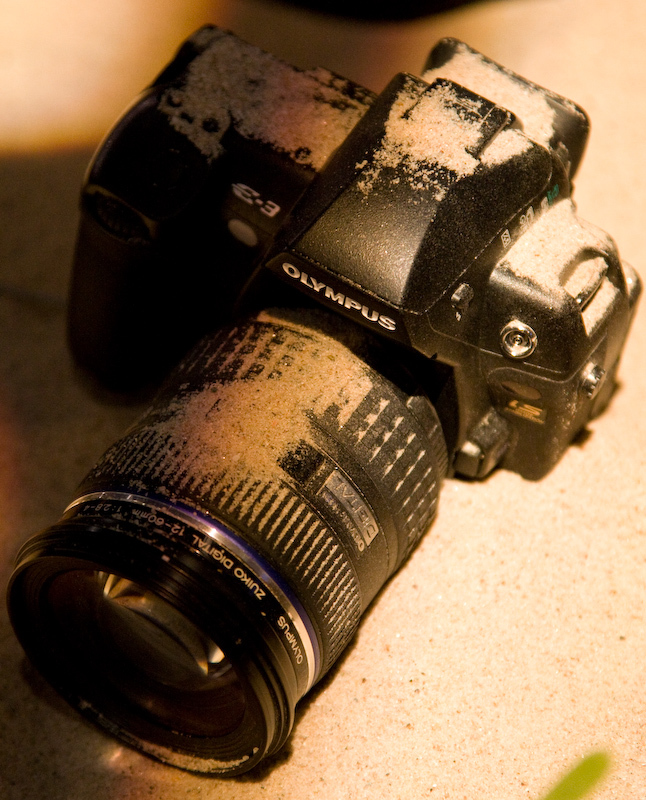 Olympus pushed the ruggedness of their E3 Camera and lenses by exhibiting several tossed in the sand. Most pro-grade cameras are weather sealed, but few manufacturers at the show went to the trouble to bring the dirt and cover their gear with it like Olympus. Maybe that's because they still feel the need to prove the point. 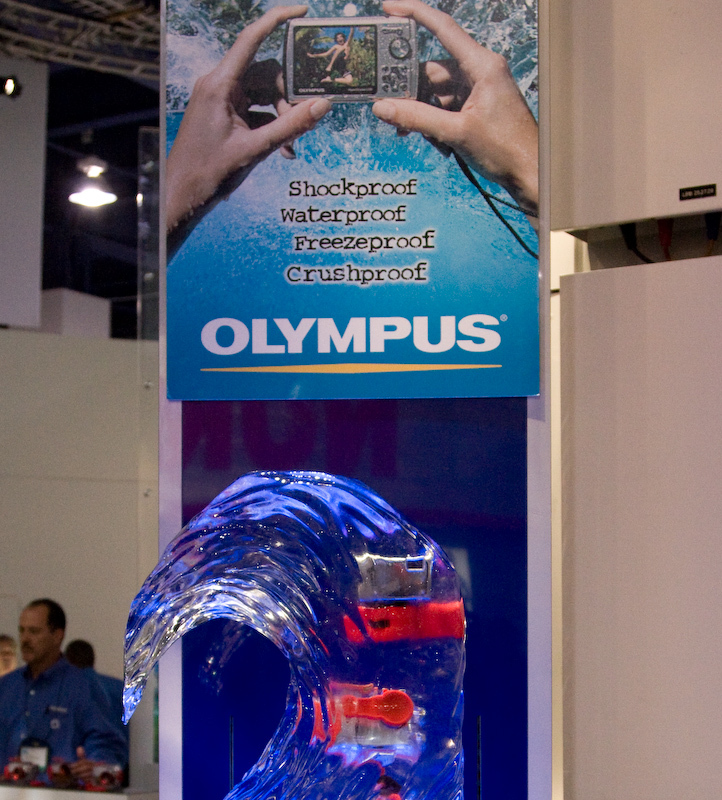 Olympus also pushed their shock and waterproof SW series consumer point-and shoot line -- again emphasizing the point with some displayed environment. It's hard to tell, but there are two cameras embedded in the ice sculpture at the bottom of this picture. I asked the rep in the booth, and he said that they "chip them out of the ice every night to test them, and they work." 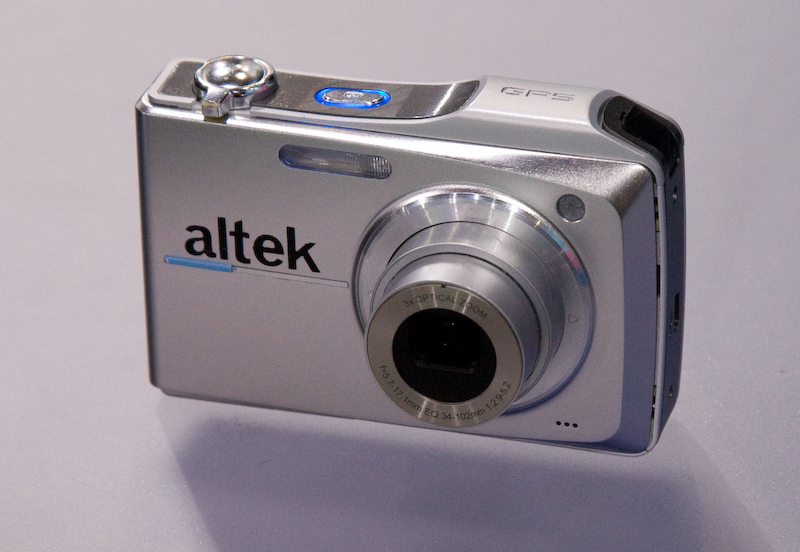 Altek showed a GPS-enabled camera that can tag photos with location information. They are the first announced camera manufacturer to incorporate the Geotate (formerly NXP, formerly Philips) software GPS solution. Since it's software GPS, it doesn't tag the photo with location information in-camera. instead, an unprocessed GPS signal is stored with each image, then when the files are unloaded to a PC, the rest of the processing is done and the location data is attached to the picture file in the JPEG exif data. The claimed advantages are lower power consumption, lower incremental cost, and smaller implementation volume. The antenna in this model is under the bump on the right, top side of the camera.